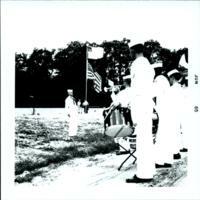 Naval Amphibious Base Band performs while guests walk along the side at the Virginia Wesleyan Village 1 Groundbreaking Ceremony on July 18, 1965. 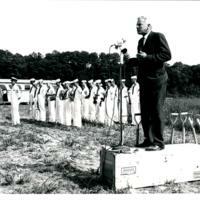 Naval bandmaster leads the band in the field at the Virginia Wesleyan College Village 1 groundbreaking ceremony on July 18, 1965. 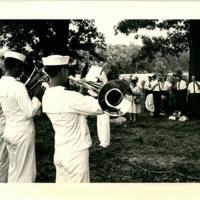 Naval bandmaster and band members at the Virginia Wesleyan College Village 1 groundbreaking ceremony on July 18, 1965. 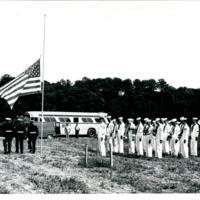 The Naval Amphibious Base Band stands in attention at the Virginia Wesleyan College Village 1 groundbreaking ceremony on July 18, 1965. 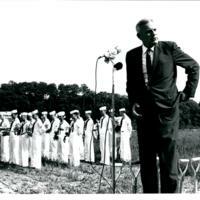 Congressman Porter Hardy on the podium with the Naval Amphibious Base Band to his right at the Virginia Wesleyan College Village 1 groundbreaking ceremony on July 18, 1965. 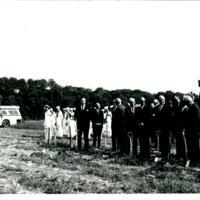 Congressman Porter Hardy greets guests at the first Virginia Wesleyan College Village 1 groundbreaking ceremony on July 18, 1965. 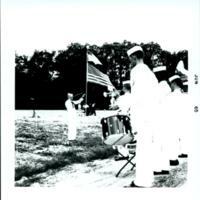 A Naval Amphibious Base Band waits in anticipation to provide music for the event that afternoon. 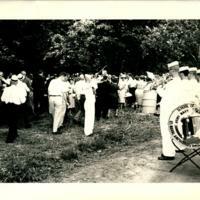 The mayors of five southeastern Virginia cities and a Naval Amphibious Base band at the Virginia Wesleyan College Village 1 groundbreaking ceremony on July 18, 1965.